Another graphic novel review (there's another one to come in a couple of days, sorry! ), this is a fairly acclaimed graphic novel that I never actually got around to completing until now. Truth be told, I was always able to appreciate it as a fine work but it never really gripped me enough to go through with it completely. But it's one of those graphic novels that your average comics fan has to read at some point, so I knuckled down and went for it. In 2003, USA invaded Iraq and engaged in heavy bombing in many key areas. Prime among these was of course the Iraqi capital of Baghdad. Among other instances of collateral damage, Baghdad Zoo took heavy damage and was left in ruins. From the midst of this carnage came a story that captivated the world, however briefly, and inspired this novel. A group of lions found themselves free as a result of the damage to the zoo, and ended up in the alien world of war-torn Baghdad. A top media attraction for a while, the story soon faded. 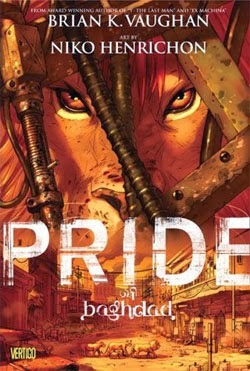 Until Vaughan and Henrichon came out with this graphic novel three years later, and reimagined the story with anthromorphised lions whose tale and interactions reflected much of the war and general political setting. The obvious Animal Farm comparisons have often been made, but where that was a biting satire of world politics this retains a more 'human' element that is not incomparable to a more serious, grown-up version Lion King. When the tale begins, these characters are still safe and sound in the closed environment of Baghdad Zoo, where a certain social hierarchy is in place, leaving the lions well and truly at the top of the pyramid. This is a position of power the pride enjoys, and the social commentary on classes and hierarchy across the animal kingdom in the zoo certainly reflects to some extent on our own society. When the shelling takes out the zoo and liberates the animals, though, it's a whole new world out there for the animals. The old social structures no longer hold. The lions are not de facto royalty any more in a harsh and unknown environment where survival is all that matters while a war waged by humans rages around them. At the same time, the essence of this story is not in the social and political narrative but in how the lions come together as a family to deal with the challenges facing them. They differ on many things, but at the end of the day they are family and have an unbreakable bond that lasts until the very end. It's a heartwarming tale, but one that has its fair share of tragedy and depth. It is well plotted with good (but generic) characterisation. Vaughan does well, but at the same time it must be pointed out that this is in some ways contrary to his natural style. The art by Niko Henrichon is gorgeous, with stunning visuals making the lions seem both realistic and human in their own special way, while the locale is perfectly rendered. This is unmistakably a book set in Baghdad when the war was arguably at its most destructive, and there are underlying narratives that also capture the general setting in a subtle manner. Again, this book was not the most gripping for me, but it is very hard not to objectively appreciate that it is a great piece of work. Definitely worth a read at some point.